Not every vintage item we find is old. Some are new things with a classic feel. Others are reproductions. Such is the case with the cool things we spotted at ReproDepot.com. This is a fun site with some great items – mostly fabrics and other sewing-related items. Some of the vintage patterns feature on the fabrics this site offers are cool. While many of them are campy, others are fun. What caught our eye for this post, was a couple of fabric prints featuring the Peanuts gang and the Great Pumpkin. So in honor of Halloween we thought we would feature them. But that is just an excuse to call attention to this site and the great stuff they offer. Tool around a bit on this site and you may get a few ideas for that quilt you wanted to make or find fabric to make a unique pillow to add some splash to your couch. And before this post is over – we have to mention the “notions” section of RepoDepot.com. As far as we are concerned any website, store, or person that offers a “notions” department is OK is our book. The folks behind Lost Cowboy are traveling today to Argentina for a ten day adventure. Which means the Lost Cowboy will kind of be the Lost Gaucho for a while. We hope to discover all sorts of great things to report back here. We are especially looking forward to the famous street markets of Buenos Aires. Our curator, Jim, who told you about the inspiration behind this site, the little “lost” cowboy he found at a flea market this past summer, is hoping to spot an Argentine version to add to the collection. Something like the little lost gaucho pictured here. This little guy is available for sale on eBay. But somehow scouring the antique markets of Buenos Aires sounds like it would make for a much better story. So here’s the deal Lost Cowboy fans… We hope to report in real time from Argentina. However, don’t worry, we have stocked daily posts to bring you right through our return. In any case, we will feature our Argentine finds at some point. See, I knew we could get through this post without a “Don’t Cry for me…” joke. Lost Cowboy is getting ready to go on a big trip (details tomorrow). Although we are going somewhere fun and exciting, we never look forward to the travel part. 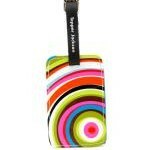 But after we found the quirky colorful travel accessories available from Tepper Jackson, we can spice things up en route. These fun luggage tags will help us spot our bags coming off the luggage claim carrousel a mile away. The passport cover will ensure we will always know where our important documents are and look cool opening it up. If we are really brave we might even try the pajamas. See the cool, quirky and colorful designs of Tepper Jackson’s website. While tooling around the internet visiting the sites we like to visit, we came across Jack and Lulu (www.jackandlulu.com) a site that is right up our alley. Jack and Lulu features an assortment of classy stationary items all of which look really nice. But of all the great note cards, invitations, thank you cards, even “scratch and sniff” cards, it was something surprising Jack and Lulu features that struck our fancy… straws. Yep, straws that you use to sip your favorite soft drink. All of us here at Lost Cowboy love straws. We go through scores of them every day. But the reason we like the “Stripey Straws” Jack and Lulu feature is because they are paper. Stripey Straws are nostalgic red and white paper straws which claim to be “earth friendly: biodegradable, compostable, chlorine-free.” Straws we can learn to love. Old school. 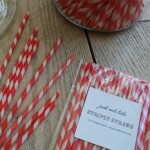 Find Stripey Straws and other cool paper products of Jack and Lulu’s website. What’s the deal with the banner? What is the image in the Lost Cowboy banner to the right of the cowboy? That is an image from a vintage postcard of Piccadilly Circus in London. 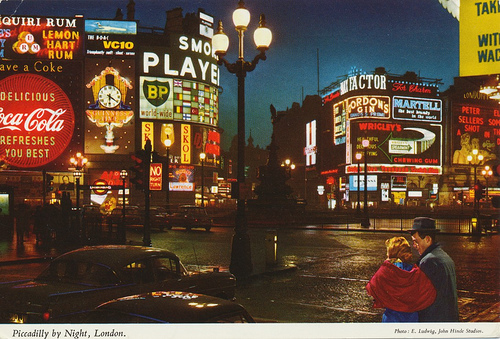 London being one of our favourite places to visit and we love vintage postcards. It was a perfect fit. We love the banner and feel it is a perfect representation of our blog. But it was a pure accident that we came up with it. We knew we needed the cowboy up there – after all he is the inspiration for this all. But the rest just came together from trial and error. The banner was pretty much done before we realized it was not wide enough. We tried stretching the words and the cowboy, but nothing looked right. We needed another image or two to make it complete. While searching through our archive of images we like, this lovely rendering of a couple in Piccadilly Circus at night jumped out at us. The colors are great and it was the perfect balance for the neon “S” in the LOST. But why did we call out the “S”? Well, that is a question best answered another time. After our posting about FLOR carpet tiles last week, our Lost Cowboy curator received many suggestions for other fun floor coverings. 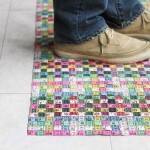 And if the tape measure mat doesn’t strike your fancy, check out the flip-flop doormat. 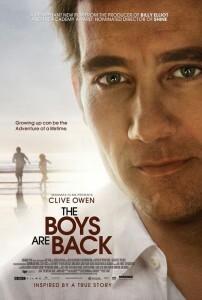 Clive Owen, who is always amazing on screen, gives a career performance as a grieving widower father in the current film “The Boys are Back” – a film we endorse. The story is not the most original story you will see, but very moving and entertaining made so by the great Clive Owen who is at his best here. Owen fits our sensibility by being a throwback to the great movie stars of a time gone by. He is elegant and owns the screen. Lost Cowboy is not a critic or a review site — we just call out things we like, and we like this movie. “The Boys are Back” is in limited release across the US, watch for it. Or make a note to catch the DVD or cable broadcast. Are you a familiar with Brit singer-songwriter David Gray? If you are, you are all set. If you don’t know him, you may be familiar with a few of his songs from the past decade or so, most notably “Babylon” which was played endlessly on adult-orientated radio stations. I hate to admit this, but I am one of those people that finds an artist they like and then starts to resent them when they become too popular. “He’s sold out!” I am heard to say of a singer who hits it big. In some cases this is true, in others it is just a need to feel cool. Well, it is stupid, I should still like the music I always did. So when I heard Gray was coming out with a new album, I was excited to give it a chance. “Draw the Line” is his first album of new material in nearly four years and it is great. Much of the press “Draw the Line” has received focuses on the fact that it is a departure from the “formula” that has made Gray one of the UK’s top selling artists in recent years. This may be true, he formed a new band and collaborated with different artists, but the sound is unmistakably Gray. And it is a sound that is very pleasing to hear, like an old friend coming back into my life. I mention this now, as I had the chance to see Mr. Gray perform in concert last night at Boston ’s Wang Theater, thanks to an invitation from a very dear friend. Gray put on a great show. From the second he came on stage I was in the palm of his hands. He performed songs old and new and proved to me why I liked him the first place, and, begrudgingly, why he became so popular. He puts on a great show, he looks good, sounds great and has an amazing stage presence. The Lost Cowboy recommends you take a listen to David Gray’s music – whether it is to reacquaint yourself with him or to discover him for the first time. 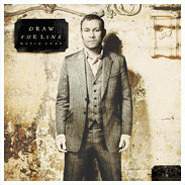 Purchase the CD or download “Draw the Line” on Amazon. I have two cats, but I am not a cat person. My house is not full of cat pictures, statues and tapestries. My big secret is that I am a dog person, even though I do not have a dog. Nor do I have a house full of dog-inspired memorabilia and have always thought it to be a bit tacky to decorate based on your favorite breed. Although we all know someone who loves a particular breed, say Yorkies, and their house is full of Yorkie stuff like pillows, sweatshirts, plates, etc. 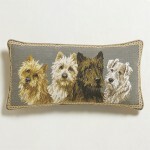 However, I am thinking about changing my opinion as a result of coming across these cushions made by Chelsea Textiles. 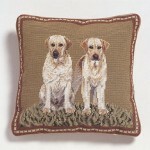 These dog cushions may look common, but you can tell right away that they are of the highest quality. One thing I like about Chelsea Textiles is that they call what they make “Antiques of the future” – I just love that confidence, and if you take a look at the furniture you can see why they can make this claim. Be ready, these gems may be a little more pricey than you expect. But who can put a price tag on joy? 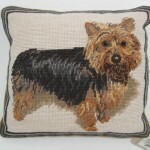 See the variety Chelsea Textiles Dog Cushions here. I realize that by now you are scratching your head still wondering what this blog is all about. I don’t know what to say other than I remain convinced that over time there will be a narrative and it will all make sense. So hang in there. We’ve learned so far that I have been cleaning out my parents’ house and finding treasures. We’ve learned a little bit about things I have come across that strike my fancy. But that’s it, aside from a few random bits about places and things I love (London) and promises it will all come together. Today is no different as I tell you about my love of bicycles. I like everything about bikes. I like riding bikes. I like looking at bikes. I just like bikes. Oh yeah, we have also learned I like new ways to use old things. This stuff is seriously cool and a very clever use of the bike parts. Some of these pieces are works of art that could totally transform a space from frumpy to hip. I particularly like the chair. Lost Cowboy is powered by	WordPress 5.0.4 and delivered to you in 1.038 seconds using 78 queries.